So if you are into the blogging world at all you have probably heard that Google Reader is closing. Um, what?! So I decided to make the ole switcharoo and head on over to Bloglovin and while doing that I decided to change the name of my blog to a dot com....so my blog will officially be over at www.Graciouslysaved.com. If you would like to keep on reading click below to follow me over on Bloglovin! It's super easy to switch your blog on over to a dot com and through Blogger it only cost $10/year. 1. Go to settings. Then Basic settings. 3. Type in the dot com address you would like and see if it is available. If it is not they will recommend some for you. 4. Pay and you are done. Easy as that. It takes about 24-48 hours to make the switch and your readers should automatically be redirected. 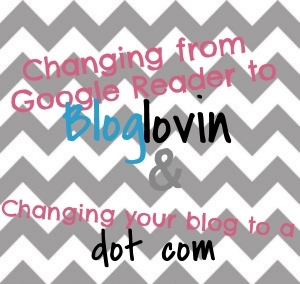 And they have made the switch over to Bloglovin super duper easy. 1. First, click on over to Bloglovin. 2. Click sign up in the upper right hand corner. 3. Once you have signed up click yes to import and follow your blogs from Google reader...easy as that! 1. Click on your name in Right upper corner. 2. Scroll down to My Blog. Click that. 3. Then click Claim blog. 4. Type in your blog name and it will give you a code to post on your blog. BlogLovin even has an app which I know I will love. Get it here. If you would like to continue reading about us as we go about this crazy life of ours click below. Thanks for the helpful update; looks like I'll be doing the same! Thank you Stephanie! This is awesome and I have made the switch as well. I may feature a link to your blog on my blog to spread the word if that's ok. Yes absolutely! Glad you found it helpful! !